Couldn't find a thread to post fishing pics, if there is one please feel free to move this. Caught this nice carp Friday, just a piece of bread pinched on the hook so it floats on the surface and crept around with polarised glasses on watching the water, great to target a specific fish and actually catch it!! Wow. Any idea of the weight? Was this catch and release? This was a few weeks ago. Dang near jerked my arm off when it hit. Man warren that is a fat ole boy there. Thought you had a coelacahth there for a minute! We have lots of carp in our Mississippi River where we are but most locals don't eat them unless they are smoked. The fish market will buy them though. I belong to a paddling forum as well and many of the UK members tell tales of their run in's with the angling community. Here there is enough river for everyone it seems. I call them Bluegill. Some folks call them Brim. Depends what part of the country you are from I guess. 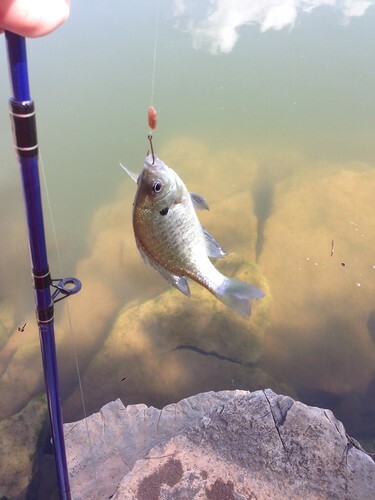 In the North they are bluegill in the south brim. or simply panfish, or sunfish. The get a decent size but mostly all you'll catch are the smaller ones. But you'll go through about 10 worms before you snag one. The good keepers are the size of your hand or bigger. I have days when the fish snag the bait without getting hooked, sometimes when using worms cutting them in half or even smaller helps as the fish have less to grab for and have to get closer to the hook which usually means more hooked fish for me, depends on the fish and fishing style as well I guess. That's true. A big issue with these little guys is using a small enough hook. I lost a few worms until I finally swapped out the hook for a smaller one. Started catching them at that point. That particular day I was looking for a small one to use as bait. Large bass like to come to the shallows to feed on them. But for a fun day out in the summer it's just a rod and a couple of loaves of unsliced crusty bread, just tear a bit off and pinch it on the hook and wait for the fish to grab it. Sounds exactly the same. Fish are fish. Most are scavengers or opportunistic predators. All those baits are used here as well. Pretty much anything you can get on a hook. My large tackle box weighs about 30lbs. That's like me. Sure I would love to catch something, but I'm just as happy throwing a line and hanging out. The only time I've caught fish that were more than 10 pounds was in the ocean. I have run my canoe over carp that must have rivaled the first one warren as they have come near upsetting my canoe. One of my fondest fishing memories was during a vacation in Oregon. My wife and I camped in a pine forrest that had been closed to the public for the previous two years and was just opened for camping. the pine forest made a sound absorbing carpet lending a surreal quality to its quietness. we camped next to a fast moving cold stream it was October I think. chilly. woke up and put a salmon egg on the tiniest of hooks. threw it in the stream and let it flow with the current. within a couple seconds the trout struck and snapped the 2 pound test line like a bow string. Got two small trout. Still had a pile of burning embers from the camp fire. caught cleaned and cooked right on the coals in less than 10 minutes. It remains the best trout ever. How about a really old (40 years) catch of the day? Here's my mom, holding a 25 lb barracuda. We were out fishing when we got into a school of small mackerel. My mom hooked one, and all of a sudden it zoomed under the boat. Next thing we know, this barracuda is flopping around inside the boat and my mom has half a mackerel on her line. My sister and I were hanging off the end of the boat, wondering if we were better off in the water, and my dad started beating on the barracuda with a billy club while my mom was kicking it. The billy club broke and dad finished the fish off with a beer bottle. We were really lucky--it never opened its mouth. We found out later that it had almost cleared the width of the boat (it had an 8' beam), and hit the back of one of the seats, splintering the 1/2" plywood under the cushion. My mom looked in its mouth and touched one of the teeth when it was dead--split her finger like a razor blade. Our biggest fish ever---and it jumped in the boat!